When we think of fried foods, grease and fat tend to spring to mind. 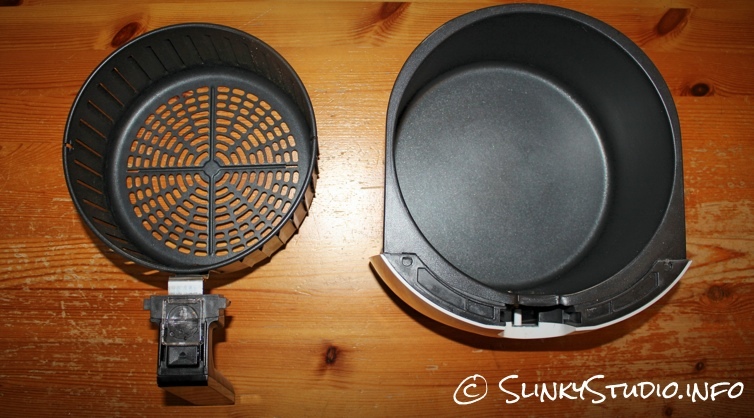 However, those elements can be removed and replaced with healthy water vapour thanks to the modernisation in frying techniques seen in the Russell Hobbs Purifry healthy fryer, which can roast, bake or fry. 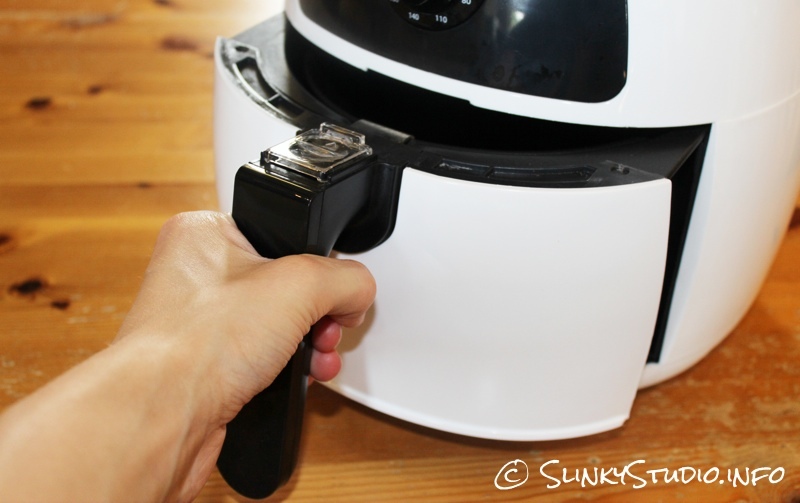 The Russell Hobbs Purifry tries hard to fit into a kitchen workflow so that it doesn't become a menace to operate. Two turnable knobs are located on the front of the Purifry: one controls the variable temperature which can be cranked up to 200 degrees and the other is an analog 60 minute timer which has a satisfying bell that rings at the end of a cooking cycle. A 2 litre (ideal for four people and under) cooking basket (supplied with a removable separator so you can cook two items next to one another) gently glides in and out of the Purifry. The moment this is removed from the fryer the appliance shuts itself off and it only resumes when it's replaced - joyously simple. The glossy white exterior body attracts dirt, so on occasions it can become inexplicably dirty, but it is easy to wipe clean. A novelty we admire about the Purifry is that if you stand back and look at the overall design, you see a face portrayed by the placement of knobs, lights and the basket handle. The design's shape is reminiscent of the character 'Eve' from the fantastic Pixar movie 'Wall-E'. Although not an imperative for the working of the Purifry this is a nice piece of design. The tech is very simple: fast-circulating hot air cooks food within the basket which has dozens of cut-outs along the sides and bottom allowing air to enter from all directions. This basket sits within a bowl that catches debris from the basket and they can become separated with a press of a button located on the handle. The air is sucked into the Purifry via the top of the unit and hot air flows out of the rear, so it's very important that the Purifry has good ventilation wherever it's used. 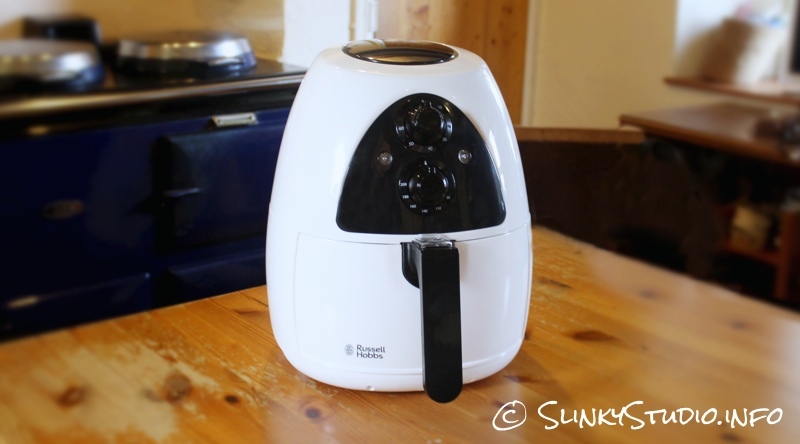 What's remarkably contrasting to traditional oil based deep fat fryers, where a waiting period for the oil to heat is required, is that the Russell Hobbs Purifry is instantly ready to use. But because of this, does it truly offer an authentic alternative to deep fat frying? Well, to answer that question, we've been air-frying on a regular basis. Let's start by talking about homemade chips/fries, the results of which vary dependant on the variety of potato used and thickness of the slice. Generally speaking, with a mere teaspoon of oil drizzled over them, freshly sliced, dried potato chips (which have been previously soaked in cold water for 30 minutes) loaded into the basket at max capacity take 25-30 minutes to cook at 140 degrees; lower than the Russell Hobbs' recommended temperature because we find this results in a more crispy and even cook. We always set the timer for half the amount of total cooking time required and shake the basket's contents halfway through, then continue to cook for the same amount of time to ensure an even cook throughout. The resulting chips are fluffy in the middle and golden and crispy on the outside. So these are just like deep-fried chips but extremely healthy in comparison. They are a night and day difference to homemade baked chips which people choose to make as a conscious healthier option to fried, which are OK but not chips as we expect them. One of the only contrasting differences between deep fat fried chips and air-fried ones, is that there is no greasiness; but the food isn't dry, instead it's moist. We actually prefer the pure fluffy potato taste without the addition of grease. The Russell Hobbs Purifry isn't just for chips though. We also experimented with four different onion ring recipes, and can conclude that breadcrumbs are an essential exterior layer to keep the batter intact when air-frying. We also cooked roast potatoes (par boiling still essential), sweet potato chips, carrot chips and even a chocolate cake with success. Frozen chips and other frozen foods can also be cooked, and in our testing have turned out richer and more flavoursome when compared with traditional baking - and much quicker too. The increased speed is apparent with everything we cooked within the Purifry, with the roast potatoes in particular standing out, as they only took 35-39 minutes and were gorgeous: fluffy and silky in the middle, with a definitive exterior layer of crispness that truly rivalled the authentic roasting method. Cleanup is very easy if you have a dishwasher, as both the basket and bowl are dishwasher safe. We can conclude that air-frying is not a gimmick. It really does work and serves as a healthy alternative to deep fat frying that also includes the flexibility to roast and bake.